When in Spain many people may wonder about scorpions, spiders and venomous snakes and will not be aware that they are much more likely to endanger themselves and their pets by getting too close to an innocent looking line of caterpillars that can be found crossing a pavement, road or footpath during the first months of each year. As a moth it has no means of causing us harm, it is only during the development as a caterpillar that you need to be cautious of this small creature. 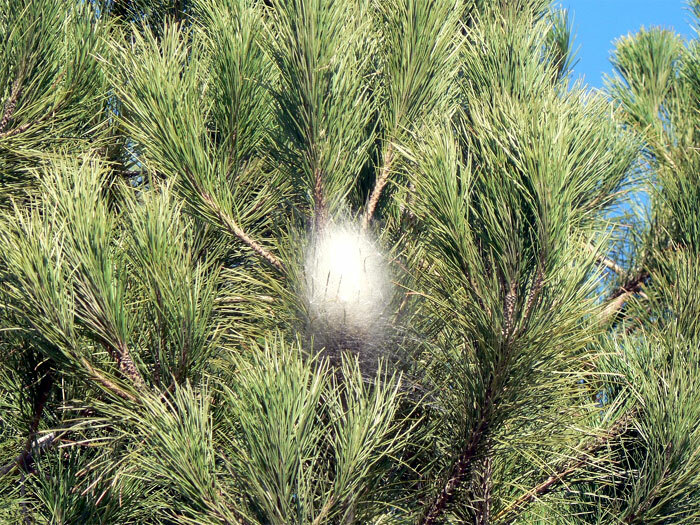 The moths seek out pine trees in the warm summer nights, lay clusters of eggs on the pine needles and so the process begins. 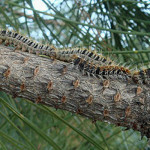 There are 5 instars or growth stages to these caterpillars, where they gorge on pine needles, shed their skins and double in size. This growth occurs during the winter when they disperse through the tree at night to feed, thereby avoiding predation, and collect in communal nests by day to increase their warmth and ability to digest. 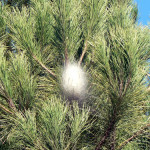 Note that the white candyfloss like nests are cleverly positioned for maximum sunshine. By February these nests can be looking a bit dishevelled, this is because a nest may hold around 300 caterpillars and with no single entrance hole they push their way through the layers, the green bits collecting at the base and falling to the ground beneath are excrement. The time for them to leave the nest in preparation for the next part of their lifecycle varies with temperature, spanning from January in warmer areas to April in the cool of the mountains, with a few even falling from the trees during windy weather. It is as they leave the trees that most people and pets come into contact with the caterpillars, sometimes with very painful consequences. They are the only caterpillar here to form a long chain, touching nose to tail. This snake-like procession is a real giveaway as to their identity. The line may stretch for a metre or two but if disturbed there could be several smaller groups and scattered individuals. (Each being around 3 to 4cm long). 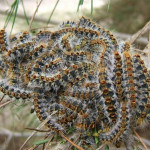 They have gone through a long feeding phase and will now search for a suitable place to burrow underground where they will undergo major changes, from caterpillar through to a moth – without nourishment. The danger that they pose to humans and animals is a very simple defence mechanism designed to stop them from becoming a meal themselves. Each caterpillar is covered with tiny barbed hairs, it is these which do us harm. They are constantly being dropped throughout its time as a caterpillar. They are too tiny to see, but cover the branches of the tree where the creatures have been feasting and of course the nests are loaded with them. They are even in the air around a heavily infested tree. Direct contact with the Processionary Caterpillar colonies as they disperse can easily be avoided once you are aware of what to look out for. Inquisitive children, adults and pets must not get too close – it is even said that treading on them has lead to a reaction, as the hairs caught on your shoe can come into contact with your skin at a latter hour. When humans come into contact with these hairs, they can cause reactions ranging from mild inflammation and irritation to severe anaphylactic shock. If the hairs contact your skin a rash soon forms which can be incredibly itchy, painful and lasts for as much as three weeks. 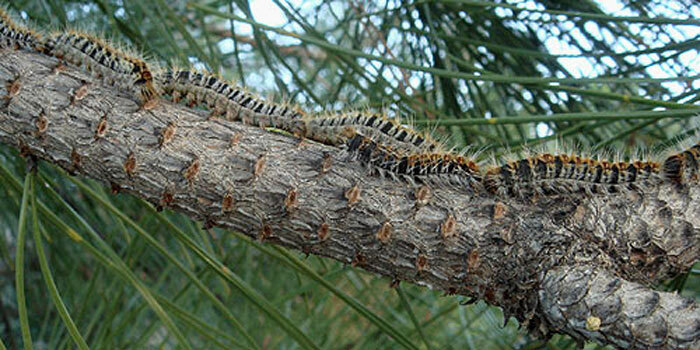 The worst problems occur if you make contact with the caterpillar directly and ingest the hairs. If you get any reaction from contact with these insects medical advice should be sought. 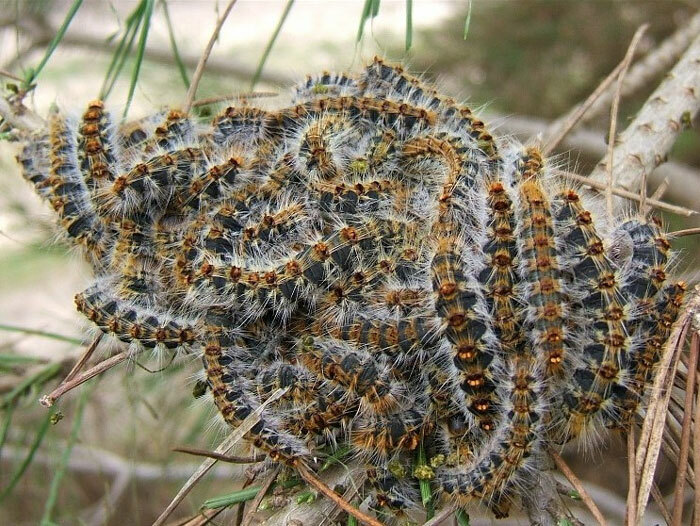 Veterinary services have many emergency calls at the time when the caterpillars are migrating to the ground as dogs can get too close to the intriguing procession and may pick up the hairs onto their paws, these irritate and so they lick them. Once the hairs are on the lips/tongue it will induce itching, swelling and possibly vomiting. Look out for the symptoms of: small white spots in the mouth and on tongue, excessive drooling and chomping. In some cases partial amputation of the tongue is the best course of action. 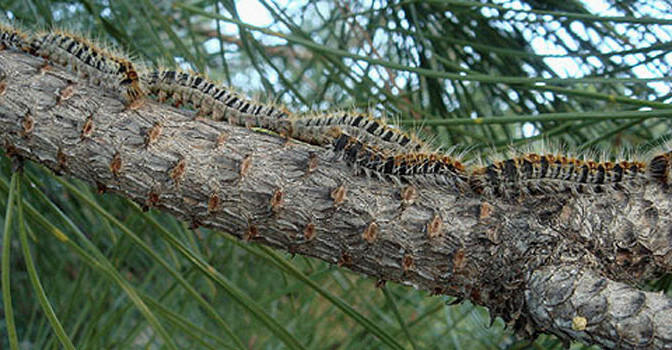 These pests which eat only pine needles, are found in warmer parts of Southern Europe, North Africa and across to the Near East. Milder winters are allowing these insects to expand into new areas, both into more northern latitudes and higher elevations. Their favored food tree is Black pine (Pinus nigra) followed by Canary Island pine (Pinus canariensis), Scots Pine (Pinus sylvestris), Maritime Pine (Pinus pinaster), Aleppo Pine (Pinus halepensis) and Stone Pine (Pinus pinea). Under no circumstances should you try to handle the caterpillars or their nests. Previous PostA circuit to their highest point in Valencia with the team from Keswick!Next PostMarch – Bird migration is in full swing. Wild narcissi, beginning of wildflowers and orchids, plus a growing selection of butterflies.